The year was 1955 when Baton Rouge High School freshman Johnny Ramistella attended a country music revue at his school that featured an up and coming artist by the name of Elvis Presley. “Elvis played two songs—That’s All Right, Mama and Blue Moon of Kentucky. He didn’t even have a drummer. It was just Elvis with his guitar and a bass player,” recalled Johnny in a 2007 interview. (1) It was a moment that put him on his career path. Born in New York City and living there the first five years of his life, Johnny returned to visit his aunt in 1958 when he set out to meet Alan Freed, at the time the most influential DJ in the country. The fifteen-year old met Freed and Freed’s manager, Jack Hooke outside the WINS studio near Columbus Square. “My name’s Johnny Ramistella,” he said. “I’m from Baton Rouge, Louisiana, and I have a band. I play and write and I’d like you to hear my music.” Incredibly, Freed handed him his business card and told him he had an office in the Brill Building on Broadway. “Why don’t you come down tomorrow afternoon?” he said. He did go, of course, and played several songs for Freed and Hooke. Hooke called George Goldner, owner of the Gone and End record labels, to set up a recording session. Nelson did record I’ll Make Believe and placed it on his LP More Songs By Ricky in 1960. Rivers, who had come a long way in the space of four years, achieved much but still didn’t have a hit record. He moved to Los Angeles in 1961 and worked as a studio musician, songwriter and a producer. Working those late-night shifts in the early 60s, he often stopped at an Italian restaurant-bar that stayed open late and featured a jazz trio. One night in 1963, the jazz trio on the bill didn’t show. Bill Gazzarri, the restaurant’s owner, asked Rivers, who was anything but a jazz musician, to fill in until he could find another band. Rivers agreed and hired drummer Eddie Rubin, thinking the gig would be just 3 or 4 nights. Rivers performing in the mid-60s. Suddenly, Rivers and Rubin caught the attention of the late-night Hollywood crowd. Word spread and soon the restaurant was packed nightly waiting to hear Rivers brand of rock and R&B at what was previously a jazz venue. With his club rocking, profits climbing and Rivers ready to leave, Gazzari appeased Johnny and let him hire bassist Joe Osborne, a full-fledged member of LA’s Wrecking Crew, to fill out the sound. Pondering his future, Rivers was approached by a rival club owner with bigger ideas. “There was another club prior to that which had been the hot spot called P.J.’s. Trini Lopez had recorded a live album there. We started cutting into their crowd and business. Elmer Valentine, an owner of P.J.’s, came in one night,” Rivers recalled. Valentine had just got back from a vacation in Europe. He told Rivers there was a popular club in Paris and all they did was play records while people danced. It was a discotheque of the same name. Valentine set the hook. “My concept is, if you’ll sign for a year, we’ll let you play three sets a night, 45-minutes each, to keep the dance thing going. 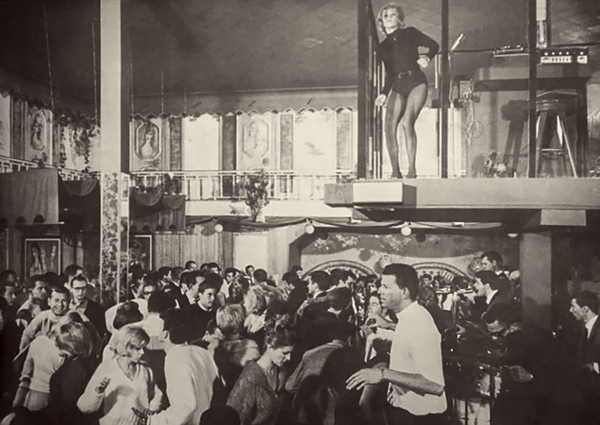 And I’d like to have gals – go-go girls - playing records in-between,” explained the club owner. With a big offer on the table, Rivers approached Gazzarri about a pay raise. “He gave me this poor mouth story about how there were lots of people in his club when we played, but that they weren’t spending any money,” Rivers recalled. “On November 22, when [John] Kennedy was assassinated, I was upset and called Gazzarri to tell him I wouldn’t be in that night. He wanted me to go in and play anyway! That made my mind up not to stay with the jerk,” Johnny said. Rivers’ decision was clear. “I called Elmer and said I’d do the Whisky thing. I just brought my following up from Gazzarri’s to the Sunset Strip. 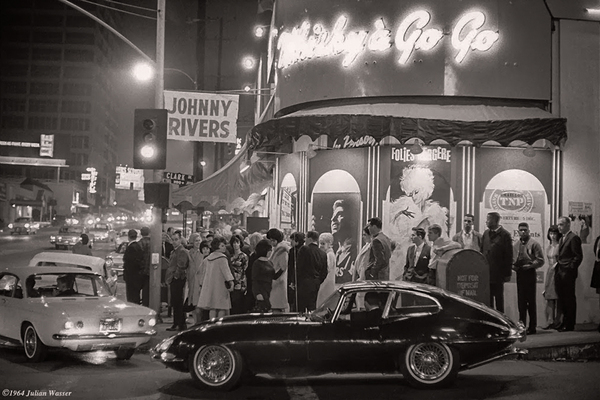 (4) The opening of the Whisky A Go Go was on January 15, 1964 and it was a rousing success. Among those many people in the crowd was producer Lou Adler. Observing the excitement of the crowd and the electricity Rivers created, it was Adler who came up with the idea of recording Rivers’ performance for a live album. Lou presented the idea to an enthusiastic Rivers, who still hungered for a hit record. Rivers success in 1964-1965 continued with Maybelline (#12), Mountain Of Love (#9), Midnight Special (#20), Cupid (#76), Seventh Son (#7), Where Have All The Flowers Gone (#26) and Under Your Spell Again (#35). (7) Rivers string of hits shouldn’t be underestimated as this happened at a time the charts were filled with British acts. In early 1965, Rivers recorded a 40-second opening theme for the hit British TV series Danger Man that would be used for the U.S. airings. The original show aired in England for two seasons in 1960-1962. CBS ran the series for a few months in 1962. The show was revived in England in the fall of 1964. Johnny and Lou were touring Europe and met with the shows producers during the British leg of the trip when asked if they would come up with a new theme for the American re-release. The song ran during the opening credits of the TV series Secret Agent in the spring of 1965. That was the last anyone thought of it— until Liberty Records began to get requests for it. “The show was an instant success here and people started calling radio stations to see if it was a record. Then the radio stations started calling the record company. We said, ‘It’s not a song, it’s only a verse and a chorus.’ They said, ‘You ought to finish it and make it longer,’ Rivers recalled. This is the opening to the TV series Secret Agent. Judy Garland introduces Johnny Rivers on the May 26, 1966 appearance on The Hollywood Palace. 1) Johnson, Eric, Monterey County Weekly, Johnny Rivers created a lot more than ‘Secret Agent Man,’ April 12, 2007. Link. 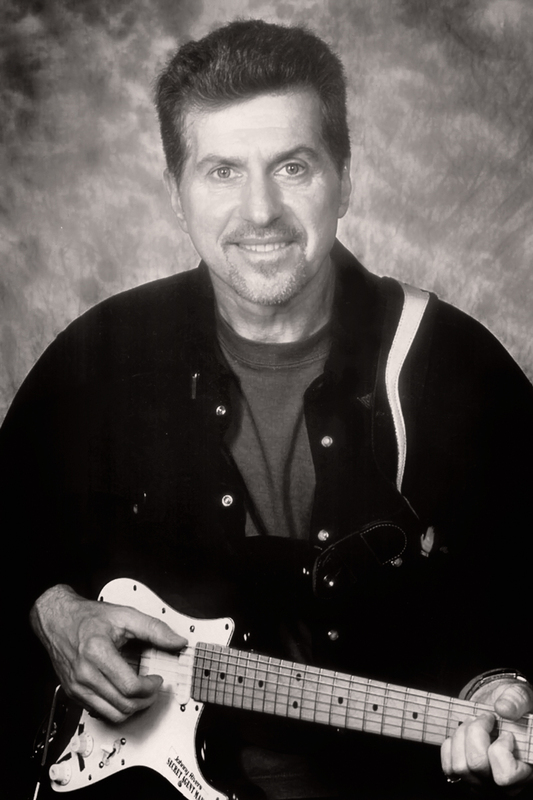 2) Aswell, Tom, The Louisiana Music Hall of Fame, Johnny Rivers biography, Link. 3) Hazen, Cindy, Vintage Guitar Magazine, A Conversation With Johnny Rivers, June and September 1998, Link. 4) Clash, Jim, Forbes, Johnny Rivers On Whisky A Go Go Club, Bob Dylan As First Rapper, May 16, 2015, Link. 5) Kienzle, Rich, Liner Notes from Johnny Rivers Anthology 1964-1977. Rhino Records, Inc., 1991. 6) Whitburn, Joel, Top Pop Albums 1955-2000, Page 738. 7) Whitburn, Joel, Top Pop Singles, 1955-2002, Pages 594-595. 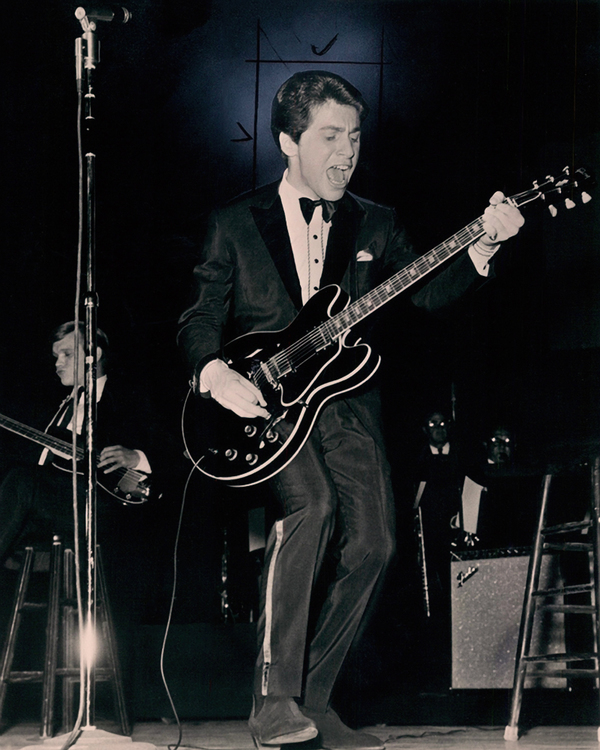 8) Lewis, Randy, Los Angeles Times, Johnny Rivers: the 'Secret Agent' of rock 'n' roll, January 14, 2014, Link. 9) MacIntosh, Dan, Songfacts interview with P.F. Sloan, Link.